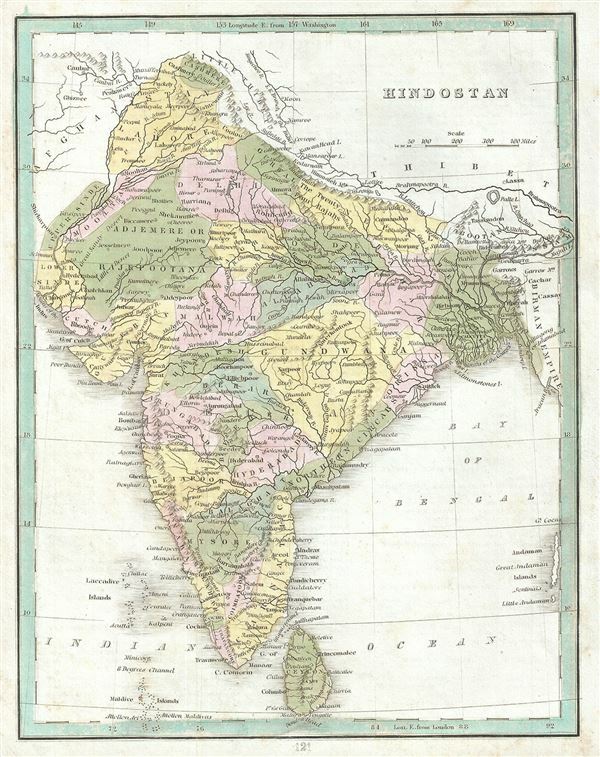 This is a beautiful 1835 map of India by the important American mapmaker T. G. Bradford. It covers the subcontinent from Little Tibet and Cashmere south to Sri Lanka or Ceylon and from the mouth of the Indus to Birmah (Burma or Myanmar). The Maldives and the Lakshadweep Islands (Laccadive) are included. The modern day countries of India, Sri Lanka, Pakistan, Nepal, Bhutan, Bangladesh and Burma are included. This stunning map offers excellent detail throughout with color coding indicating various political divisions and princely states. Countless important cities including Delhi, Agra, Lucknow, Catmandoo, Goa, Bombay, Calcutta, Colombo, and others are noted. Most of India had, at this juncture, fallen under the control of the British East India Company. India, long an exporter of manufactured goods, instead became a supply house for raw materials to the British Empire. The Empire by this time had also started initiating the non-economic programs for education, culture, and social reform throughout the Subcontinent. Most historians consider this to be the true beginning of India's colonial period. The East India Company ruled India until 1858, after which it was governed by the British Raj until it finally gained independence in 1947. The map was published as plate no. 121 in Thomas G. Bradford's 1835 Comprehensive Atlas Geographical, Historical and Commercial. Bradford's atlas, published in 1835 was an important work on many levels. First, it was one of the first American atlases to follow an encyclopedic format, offering readers extensive geographical and statistical tables to supplement the maps themselves. Second, it was published in Boston and influenced the city's rise as a publishing center later in the 19th century (at the time most publishing in the United States was restricted to New York and Philadelphia). Third, this atlas was the first to contain a separate and specific map showing the Republic of Texas. Fourth and finally, Bradford's atlas in some instances broke the Euro-centric mold regarding atlas production. Among other things, Bradford focused his atlas on the Americas and abandoned the classical decoration common in European atlases in favor of a more informational and inherently American approach.